Pohela Boishak, the first day of the Bangla calendar, is an auspicious day especially for the Hindu community in Bengal. Pujas are given at sunrise and continues throughout the day honouring various rituals. The Muslims in Bangladesh also celebrate this event fervently and with much enthusiasm but without any devout customs. In the rural areas farmers, professionals, traders alike take on special programs to begin anew a chapter in their lives. It is a joyous celebration and everyone is welcome to join the party. It is that time when women reinforce their image as keepers of the festivities. A woman typically feels responsible for passing down culture. She believes that if her children observe her involvement in festivals they will automatically learn to value and realize the importance of carrying tradition forward. She looks upon her endorsement of festivities as something that can be emulated by the younger generation and thus sees it as her duty to carry the flag of tradition. Women play a pivotal role during such festivities. She is the cultivator of values and yet many women just find festivals fun. This is a time to rejuvenate with opportunities to add zing to their lives. Festivals are an excuse to take time out to indulge and pamper themselves, book the spa treatment, go on holidays and all without guilt. It is a time on the calendar when it's okay for a woman to indulge herself, to dazzle in carefully chosen ensemble. When it comes to the jewellery most girls would agree that you can never have too many, in fact it is an ideal time to invest in gold. Gold shops take special schemes on Pohela Boishakh. They open new accounts and provide their clients with special discounts. It is particularly auspicious to buy gold on the first day of the year as it signifies prosperity. Please take it to heart even if you do not agree with me completely, as it is a befitting moment to convince your sweetheart to spend on such a precious metal whose value can only go up. Silver is good too. Silver jewellery is stylish and hip. It is still reasonably priced compared to other metals. Tactile and workable this metal can be developed into some of the most beautiful pieces of art. Personally, I would highly recommend silver as a great investment. 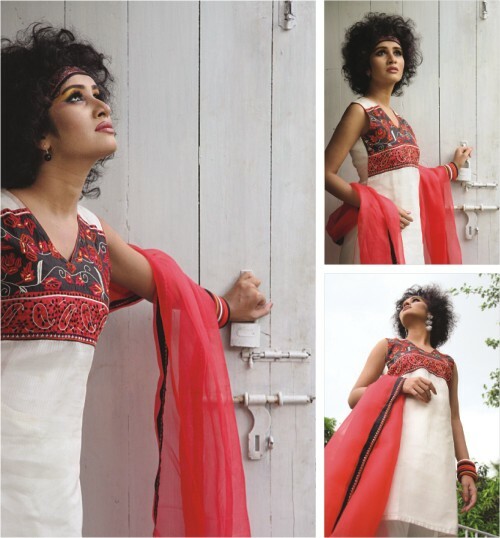 Buy traditional styles for Boishakh. Ceramic, glass, and terracotta are the other options that could be explored. Ensemble is equally important. I suppose the weather will only permit light natural fabrics, especially cotton. Sari in gossamer cotton weaves printed in equally light colours will look fresh this year. The black and red combo is so plissé and dated, it is timely for you to try new colour schemes. Pick up colours from nature and tone it down. Greens, terracotta, earth are suitable colours. Wear simple elegant saris in Tangail, printed to give it a personalized statement. It is important to understand your height and width. You should be able to carry a cotton piece effortlessly. Time tested formulas insist that a tall wide person can easily carry larger, wider, bolder pieces while a petite you, can and should stick to small borders in dainty motifs. There are of course exceptions in individual abilities to bear different styles. Suits are also great for boishakh. These are extremely popular today, as more women prefer its comfort. This Boishakh try traditional sombre suits with rich dupattas in jewel tones. Keep the styles trouble-free. Accessorise, out shine, and stand out in the crowd. I don't remember when I started being scared of snakes. I don't even remember if anything happened when I was a child, which made me afraid of reptiles for life. The first time I saw a snake was on the 26 of March 1971. All day long we stayed out on the road in front of our house erecting barricades to stop the Pakistan Army. When the Pakistan Army came in the evening in three jeeps, it took the soldiers only a few minutes to remove the barricades. The soldiers entered our house to interrogate my father. My father was an activist of the British era. He raised his voice against the British and went to jail more than once. He started raising his voice again and was under surveillance all his life. It was quite natural that soldiers of the Pakistan Army would come looking for him. With the soldiers surrounding our house and interrogation going on, the chaos within the household reached its zenith and, at one stage, I decided to peep outside to have a look at them. No sooner had I stepped outside, I met with a snake...sitting with his (or her) hood up! Lo! I fainted!! The next thing I knew was that my dad had killed the poor snake with my brother's cricket stump. The snake was a harmless <>dhora<>, the least dangerous member of the snake clan. Well, dhora or no dhora, it was a snake all the same. I have been scared of snakes ever since. My fear has gone to such an extent that I don't look at any programmes about reptiles on TV. I never visit the reptile section of any zoo. I don't look at pictures of snakes in books or magazines, always covering them up with paper or whatever I can lay my hands on. Then one day, my friend informed me that a python was caught in her tea garden. Incidentally, I had been at the bungalow of the tea garden only the night before. While I was there, the hosts decided not to tell me about the reptile in case I got scared and ran away before dinner was served. I heard about the python the next day and felt quite scared and vowed mentally never to go there again. Then I heard about the poor beast. Aww...the poor thing was caught in the tea garden not far away from Sylhet town. The garden labourers caught it and wanted to eat it up. The python was badly injured and was brought to the tea factory. It was tied to a post with a rope. It was given live chicken or goat every now and then, which it devoured with little relish and put its imposing head down as it digested its food. The snake's girth was about as big as a truck tyre and seemed like two truck tyres placed on the ground at first glance. It was black in colour and twelve feet in length. It was injured, sick and exhausted. Thousands of people thronged the factory to see it. The Dhaka Zoo and other organizations had been informed about it. The Dhaka Zoo didn't want to take it as the place was overcrowded. When the Forest Department saw that it was injured, they refused to take it. A local resort with a mini zoo refused to take it in because of the same reason. But they made it sound like they had to take permission from the relevant authorities. The dignified animal must have felt weary to be surrounded by animals of another species. The indignity of the whole situation hit me. My heart went out to the poor animal. Readers by now must be thinking that I had probably made an exception and had seen the animal. No! No way could I bring myself to see it. My phobia of snakes was too strong. But this did not stop me from feeling sorry for it. I was sad that such a majestic animal had to meet with such a poor fate. The Python died after being captive for more than a fortnight. It was really an end of a regal era!